The dashboard provides several widgets that provide a variety of views into a customer’s RiskRecon vendor portfolio. 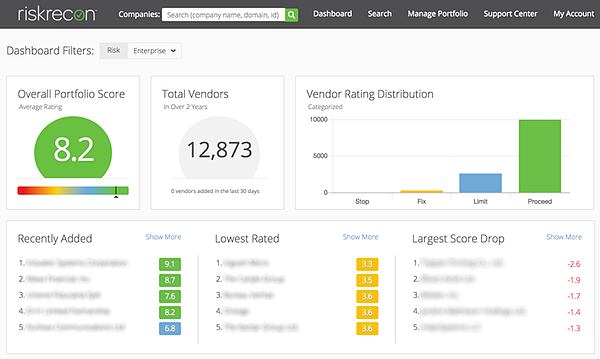 These include overall portfolio score, total vendors, and vendor rating distribution. The dashboard also provides views into recently added companies, lowest-rated companies, and companies with the largest score drop. Selection of Dashboard Filter will trigger the system to recalculate the information to match the given filter. Customers can learn more about the updated portfolio dashboard page through the RiskRecon support center, accessible from the RiskRecon portal, where there is additional documentation and user videos. 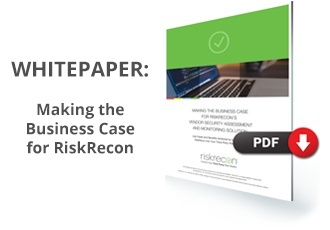 Or, contact us directly at support@riskrecon.com or through the chat feature in the RiskRecon portal. We are always happy to engage directly with customers to ensure your success!